Because of the long road journey from Ladakh to Nubra valley, we were very tired and had a good sleep in the Tirth camp(Nubra Valley). When we woke up, the whole Nubra valley is filled up with fog and it was very cold. Every one woke up at around 7 in the morning, freshened up, had break fast and again boarded our cab to visit Diskit, Hunder then return to Ladakh. I was so excited to visit sand dunes, double humped camel in Hunder. Diskit monastery is around 1 hour from Tirth camp. The road was awesome, single straight road goes through the beautiful valleys covered with snow and sand. 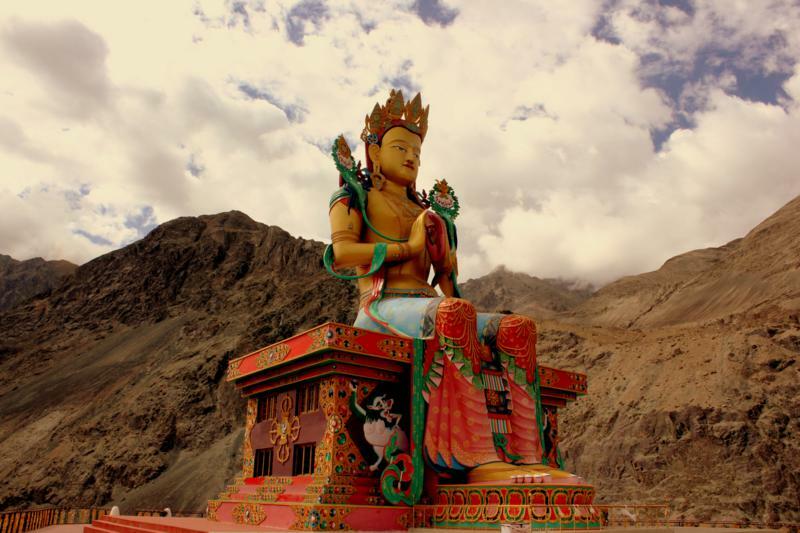 Diskit is a small village in Nubra valley, which is famous for Monastery and Maitreya Buddha statue. Our first stop was at Maitreya Buddha statue, it is a 110ft statue located on top of the hill, facing down the shyok river. According to the locals, this statue is built with an intention to promote world peace and also for the prevention of war from Pakistan(that's why the statue is facing Pakistan). Apart from the statue, we can enjoy the beautiful view of nubra valley from this hill. Inside the statue, there is a small museum that has pictures of dalai lama and Buddha. Our next stop was at Diskit Monastery. This is just 5 minutes away from Maitreya Buddha statue. 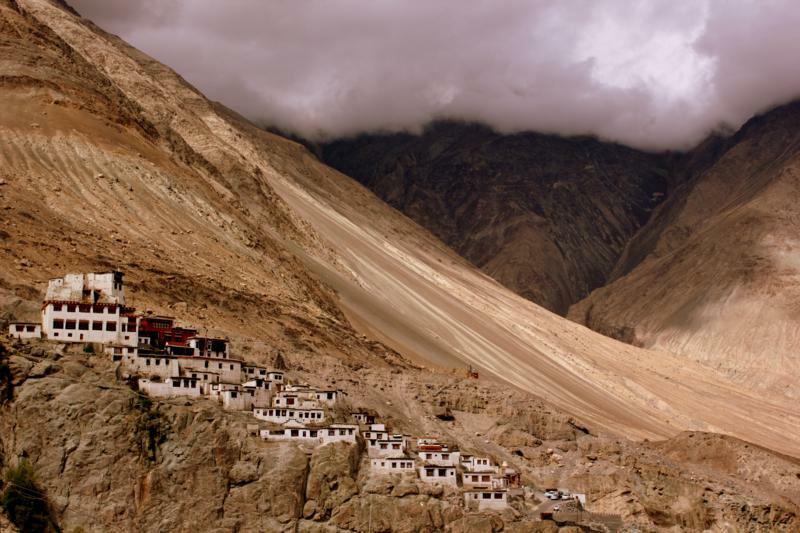 This is considered as the oldest and largest monastery in Nubra Valley and it has history dated back to 14th century. This is built on a hill, which has a school and a prayer hall.We spend some time speaking with the locals about the monastery, Buddhism, how they survive in winter and many things. Everyone we spoke in the monastery were very pleasant, calm and seems happy with their life, even without having any luxuries. 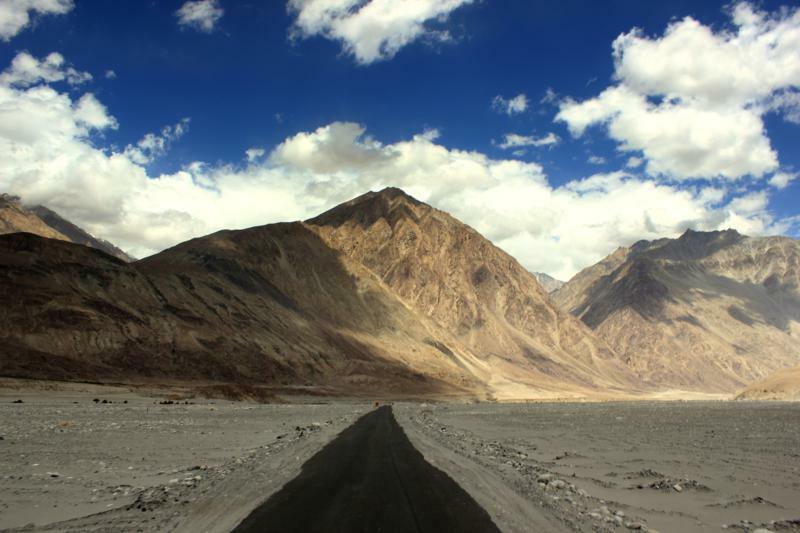 Diskit is also called as 'Orchard of Ladakh'. We can see Shyok river flowing all the way from Nubra valley till diskit. Because of the shyok river and mild temperatures, we can see many plantations/farms near diskit. 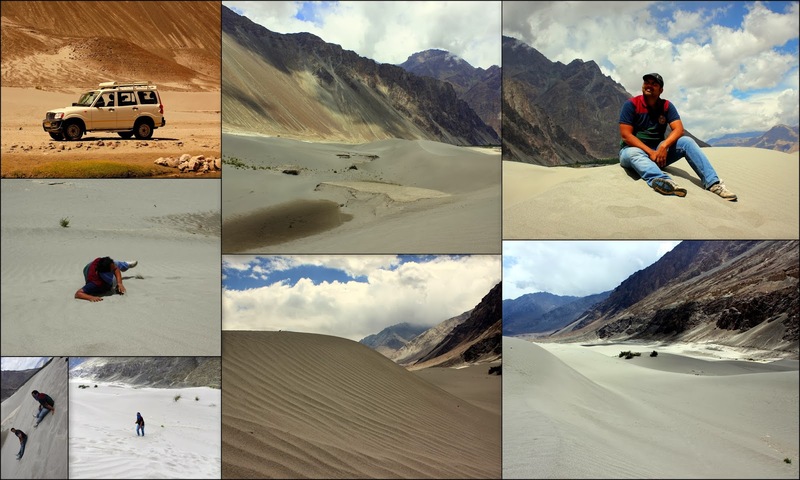 From Ladakh till nubra valley, we didn't saw any farms except in diskit. From diskit, we started toward the Hunder sand dunes. Suddenly the landscape got changed from plantations/farms to sand dunes. While we are on the way to hunder, we were surprised to see a landscape where they was a sand dune + shyok river + Farms + snow capped mountains all at a single place. Probably you won't find these kind of landscapes any where in the world except in Ladakh. After traveling for 30 mins from Diskit through the sand dunes, we reached hunder. The main attraction in hunder is desert ride on double humped camel. The view of nubra valley from hunder was awesome. We hired camels and started to experience the sand dunes of hunder. Camel ride was a life time experience, which will lasts for 30 minutes. 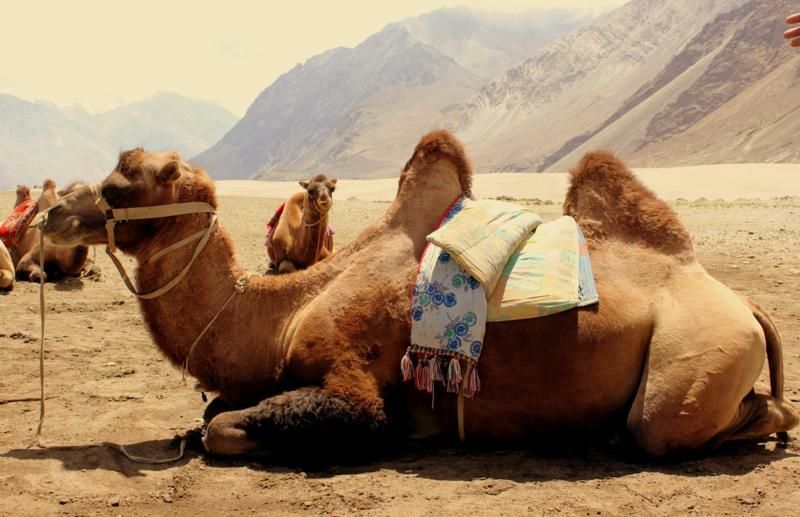 This double humped camel is very rare breed, found only in nubra valley. After camel ride, we spent almost 1 hour playing in the sand dunes. This was my first visit to sand dunes, so I got little excited and out of excitement I started sliding and rolling down the sand dunes. What an experience it was!!!! Really amazing. Not everyone was interested in sliding, but me and anil continued doing that for the next 30 mins. I was not in a mood to get back to the car, but boarded the cab as it is getting late. We started at around 11 Am from Hunder to Ladakh(150 km). As we have to cross Khardungla before the sun set, we rushed towards khardungla without having lunch. When we reached Khardungla, it was very cold and temperature was less than 5 degress, so we didn't dared to get down of the vehicle. 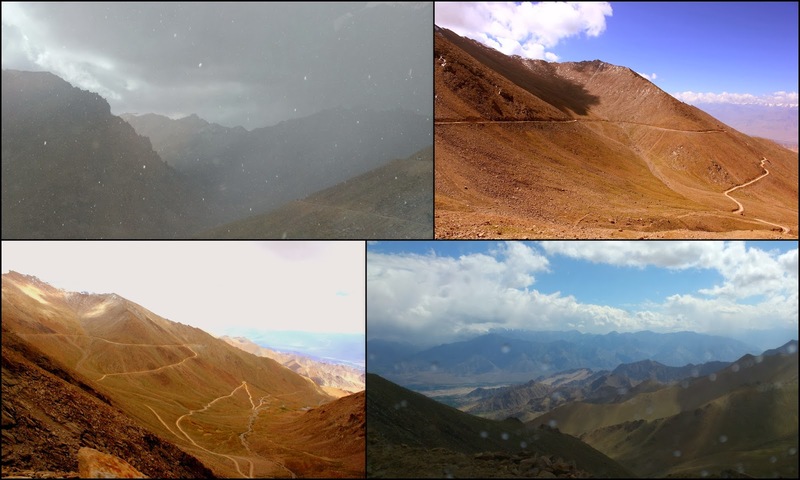 After we crossed Khardungla, there was a sudden snow fall for about 10 minutes. And finally we reached ladakh at around 6PM.